One of our most popular activities for several years. Canoe on a gentle stretch of river and learn some basic bushcraft skills such as tradition firefighting, shelter building and for longer trips wood carving. This mini package combines two fantastic activities and has been one of our most popular activities for several years. Take an open Canadian canoe on a gentle stretch of river, learn to paddle and and control your boat, even learn a little about the tradition of the sport. Then sit back, paddle gently and enjoy the scenery. At your destination you will be introduced to some basic bushcraft skills such as tradition firefighting, shelter building and for longer trips wood carving, natural cordage and some simple foraging for food. To add something a little extra why not add a stop for a pub lunch by the river or include some firelighting and cook your own food for a posh BBQ? Both options available from £10 per person. 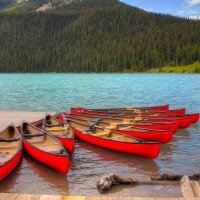 Canoe and bushcraft trips can be just for the day or can last for up to seven days and nights. With several locations around the country, there will be something perfect for you. Call us now or complete the enquiry form for more details.